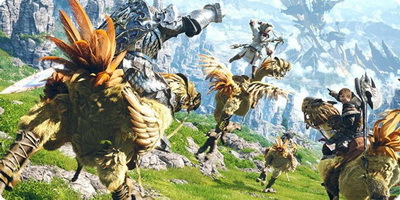 ﻿ FF14 news , Final Fantasy XIV mmosale , patch3.35, Palace of the Dead, Heavensward. If you think you’ve seen everything that Final Fantasy XIV has in its bag of tricks, the game’s Q&A panel at PAX yesterday made it clear that it has plenty of new stuff in the wings. The panel revealed that patch 3.35 will add in the brand-new Palace of the Dead, a labyrinth crawling with the undead that’s unlike any other content currently in the game, starting with the fact that it’s a randomized soloable dungeon with its own level progression system. Of course, that wasn’t revealed until the end of the panel rather than the beginning; there was enough to keep fans excited just on the basis of the panel serving as the game’s first ever live Q&A session in North America. Director and producer Naoki Yoshida, loremaster Christopher Koji-Fox, and community manager Matt Hilton took the stage to answer player questions while letting everyone know what was coming around the bed for players to look forward to. If you’re wondering when you can talk with your friends outside of logging into the game, Yoshida revealed that the team is working on developing an app that will allow you to chat with friends, linkshells, and your free company. That part is working and finished; the app hasn’t been released yet because the developers want to add more functionality such as retainer access and market functions. It’s planned for release before the next expansion. More Hildibrand quests are also planned before the next expansion, specifically in patch 3.3. There are also plans to bring over the heretofore Japan-only cross-promotional items from 7-11 to the US; the delay is due to marketing signing off on everything, as Yoshida has already given his stamp on the upcoming plans. There are also plans to get some kind of gear and/or NPCs from Phantasy Star Online 2 in the game as part of the collaboration between the titles; while PSO2 is not available in North America, the collaboration items will be available worldwide. FATEs were discusses as a possibility for gathering and crafting classes in the future as something worth discussing, albeit with no definitive plans. Yoshida also revealed that the titles for FATEs are puns in every language; rather than trying to directly translate a name, the localization teams get to each come up with their own pun titles. In Japan, most of the titles are puns based on old novels or previous Final Fantasy games. The team is also looking to change or improve the code in place for calling your chocobo companion, but the code is quite complex and thus it’s taking a while. This ties into both having your bird out while queued for dungeons and being able to call your bird within a dungeon if you want to do so. In response to a question about how many new jobs were coming with the expansion, he replied with a pause and a simple answer of “jobs,” plural. Players will have to wait until fanfest for more. Flight for the old world content was also discussed as something the team would like to do eventually, but it wasn’t originally planned, and rather than redoing the old maps the focus is on new maps for future content. Koji-Fox also fielded a question about the game’s lore, revealing that there is a very large lore bible for the game, consisting of a couple hundred pages from 1.0, more lore from 2.0 onward, and a large amount of setting information. That doesn’t mean that everything is planned in meticulous detail, though; some things are brought up and added unexpectedly. It’s why there are no peaches in Eorzea (Eorzea just doesn’t have peaches), but now it does have bears wandering around. Yoshida revealed that he hates the hidden moogle quests almost as much as you do, while he was very fond of Alphinaud’s story from 2.55 through Heavensward. Koji-Fox, meanwhile, very much enjoys putting together the lore in the FATE descriptions, which many players do wind up missing but which offer extra incentive to those who catch it. At the very last question, the team was asked about varying up the game’s patch structure… at which point the Palace of the Dead was revealed. The idea is to create more casual content that offers both more flexibility and more ways to take on existing challenges. The Palace is a bottomless dungeon filled with the undead, and those who explore this deep dungeon contend with monsters, traps, and an ever-changing layout. In functional terms, the dungeon is meant for variable group sizes, from solo players to four people working together. It also features an independent progression system starting at level 1, allowing you to jump in with your friends even if you’re a veteran and your friends have just started. Item levels are accordingly not relevant to your power in the dungeon; rather, exploration and other means will be used to power yourself up. Bosses await on multiple floors, with the game auto-saving your progress as you go along. If you fall in battle, you can restart from the last saved floor. There will be a limit to the number of floors at the start, but there are more floors planned for the future. Players will look for stones with the marks of the Twelve to power up, but some stones will also be traps, and players can expect to eventually see ranking systems based on how fast a given job can clear through the content. The Palace of the Dead is expected to drop with patch 3.35, after the main body of patch 3.3 which will also include what’s being called a treasure hunting dungeon. More details will be available early next week with the next live producer’s letter; it’s a surprising enough revelation that plenty of fans are no doubt excited to see how the system will work and what’s coming around the corner. No details were revealed about how this new progression system will work, of course. But the point is that it’s there, and it’s something entirely new. If you’ve gotten accustomed to the cadence of releases, they’ve become a bit more unusual after all.